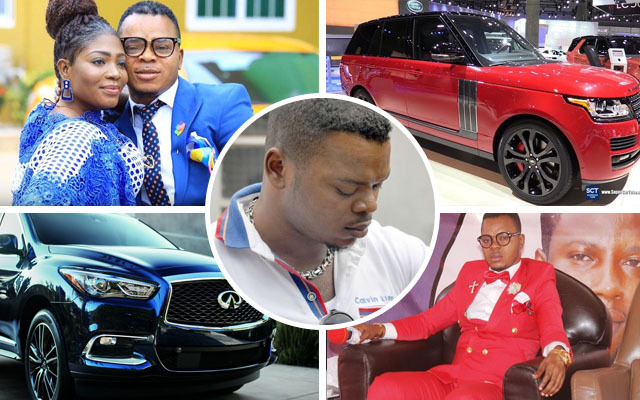 Beleaguered man of God Bishop Daniel Obinim has said God has blessed him with abundant material wealth. “I have more than 20 houses given to me by Jesus Christ. I had about eight Range Rover cars which I gifted to my pastors. I had five Infinity SUVs and three Chryslers which I also gifted to my pastors because my car is ‘AUTOBIOGRAPHY’, meaning the car’s brain power is superior to that of a human being. If you cross that car, it stops automatically, and its door is not slammed, it shuts by itself. It is also bulletproof,” the founder of the International God’s Way Church who was recently arrested for allegedly defrauding one Bismark Kusi of GHS11.6million as well as for flogging two teenage lovers in church, said in an interview. Bishop Obinim also said God Himself may soon declare him (Obinim) as God too. According to him, the next spiritual gift for Almighty God to confer on him after having made him an angel, will be to make him “God” too. “I saw Jesus Christ in my dreams, who said: ‘Collect this angelic gift.’ So, if I’m faithful to Jesus Christ, maybe the next spiritual gift He will confer on me will be a replica of what happened in Exodus Chapter 7 in the Bible where God told Moses: ‘Now I’ve made you God, so whatever you say is final.’ But now God has not made me God. Maybe the next time God will say: ‘Obinim, now I’ve made you a god, you can even conjure up money’,” he told Joy News. Meanwhile, Bishop Obinim has said he will teach those accusing him of involvement in an alleged GHS11.6 million fraud case, a big lesson. He pronounced curses on his accuser, Bismark Kusi, indicating that the gentleman and his family shall never know peace on earth. He said he would thoroughly deal with all persons who falsely accused him as their actions had made a mockery of him as well as his father Jesus Christ. “The Bible says: ‘Touch not my anointed.’ To those who contracted my accuser to disgrace me, I leave all of you to Jesus Christ in heaven. That Bismark Kusi who accused me, his family and those who appeared as witnesses, I will deal with them spiritually; my father Jesus Christ who you disgraced will never allow you to have peace. You will see what will happen to you,” he threatened. Bishop Obinim disclosed this when he addressed a gathering of church members in his house on Thursday, 25 August to state his side of the story. According to him, he had never seen or interacted with his accuser prior to his invitation to the CID headquarters. Bishop Obinim disclosed that Mr. Kusi narrated to the police that he had handed him the said amount in a ‘Ghana Must Go’ jute bag at the clergyman’s office at Tema during a counselling session. But Bishop Obinim emphatically stated that he did not conduct counselling sessions in his office but rather at the church, a fact he said confirmed his position that the story had been fabricated to tarnish his image. “He said he met me at Tema in an office but I have never even conducted counselling sessions in office before,” he added. Hundreds of jubilant members of the church had trooped to the house of Bishop Obinim to welcome him after he was granted bail. Some of the congregants who were praising God and hailing his release decided to roll on the floor as others sang to signify that “the Angel has arrived”. His arrival was broadcast live on OBTV, owned by the bishop on Thursday August 25. Bishop Obinim was granted bail after two nights in police cells. Apart from the fraud allegation against him, Bishop Obinim is also facing physical and verbal assault charges for flogging two teen lovers in church.